Accessorise your look with elegant British design by Radley. Featuring a delicately dangling Scottish Terrier charm and oversized champagne dial, gold-plated case and coral leather strap, this sophisticated timepiece exudes sophistication. 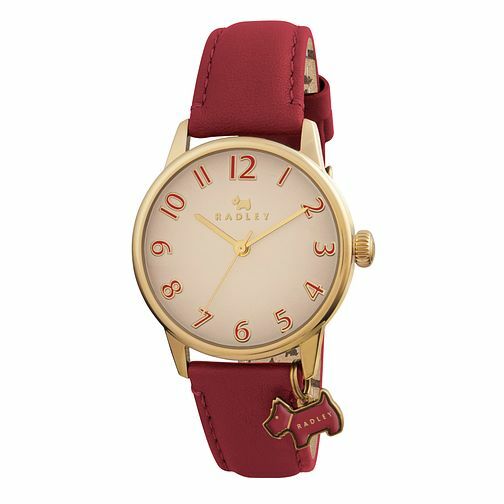 Radley Ladies' Scottie Dog Charm Coral Leather Strap Watch is rated 5.0 out of 5 by 5. Rated 5 out of 5 by Anonymous from Large clear face I purchased this watch as a gift for my wife for Xmas. She is delighted with it as it has a large clear face, leather strap and dangling Scottish Terrier charm. Another great timepiece from Radley and sold by H Samuel at a great price.